I am feelin’ the love!! Not because it’s Valentine’s Day, not because I am still in love with the hubs (which I totally am), and not because Hugh Jackman showed up at my door with a dozen red roses (hey, a girl can dream, no?). No, I am feeling it because of all of YOU. After my defeated post yesterday, you all rallied around me and lifted me up so high I got a little vertigo. I can not thank you all enough for the encouraging words and tips and suggestions. It’s because of you guys that I keep on blogging. If I could plant a big sloppy kiss on all of you I would. Okay maybe not, because that would be awkward. But just know that I appreciate you guys SO MUCH. One of my readers even offered her Personal Trainer services to help me finish my training so I will be totally ready for the race in a month. How cool is that?! So I forgave Running for beating me up on Saturday, and this morning we enjoyed a little time together on the treadmill. I increased the incline to 1% like Pubsgal suggested and that made a difference – not enough to make it super difficult, but enough that I noticed it. Running and I have been reunited and it feels so good. Oh gosh!! You have to see this – take 30 seconds out of your day and watch this!! I mean, what’s Valentine’s Day without a little Barry White?! The larger-than-life lapel!! The super glittery suit!! The hair!! Seriously, what’s not to love about this?!? Okay, that’s enough Love in the 70s for one day. Thanks again for being so great – I love the blogosphere! I hope you each have a nice Valentine’s Day! 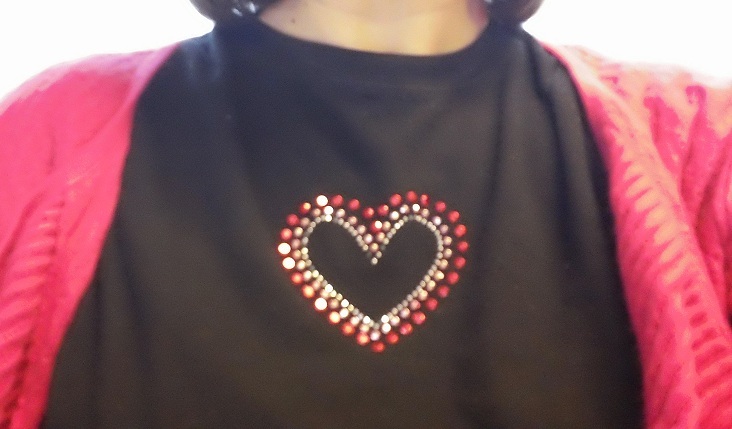 Self portrait - my Valentine's shirt. So glad today is a better day!